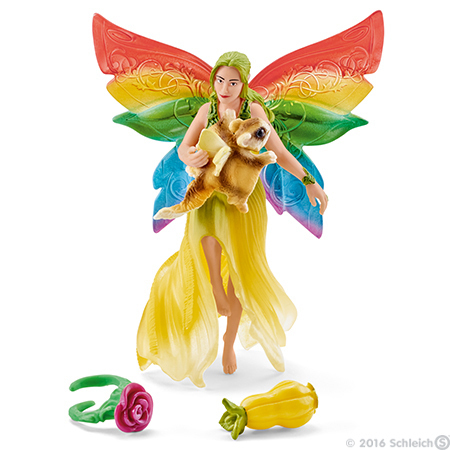 Rainbow Elf Meena with Flying Squirrel Figurine from Bayala series. Made by Schleich in 2016. Meena figure comes with a beautiful friendship ring set with a red rose and also comes with a honeyfruit. Brand new, never used or played with. Figurine comes in original Schleich packaging. Meena is 4 1/2 inches wide by 3 inches wide. The squirrel is 1 1/2 inches long. The accessories are each 1/2 inch wide. Meena has a magical power that makes all animals love her. They allow her to stroke them and even eat from her hand. Meena and her flying squirrel are simply inseparable. The little furry animal follows the elf everywhere. They both have the same favourite food: honeyfruit! They usually meet at their favourite place: beneath an ancient elm where they frolic around, attempt little magic tricks in the shade or share a honeyfruit between them. Meena is wearing a beautiful friendship ring set with a red rose. There's another identical ring for her best friend. Could that be you?